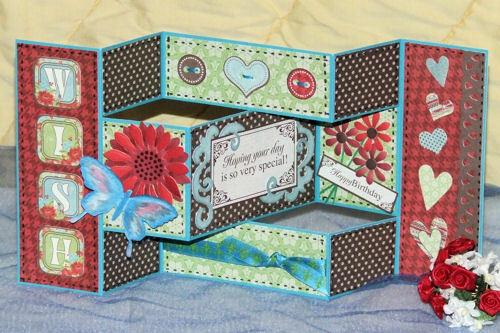 I made this tri-shutter birthday card using papers from the Chocolate Dipped Artful Card kit from Hot off the Press. I used the 15 Butterflies and Dragonflies template to make the butterfly and painted it using smooch inks. The instructions for the card came from Splitcoast Stampers. Read more about this card in my blog.